So who doesn’t love a dip? I’m sure there are millions of Baba Ghanoush recipes online and there is nothing particular about this one, but here goes anyway. This is really a basic one. Maybe some versions with a twist will feature in posts to come, but this is actually really nice just as it is. I think actually men are less likely to love a dip than women. I haven’t done real quantitative work on this, but my husband’s not particularly interested in dips and neither is my father, so there. Dad’s not the most adventurous of eaters anyway though, so maybe he doesn’t count. I just spoke to him on the phone and he was telling me about a high school graduation party they went to over the weekend and the food there. It was my cousins daughter’s party. My cousin had hired one of the Finnish top chefs Jyrki Sukula to do the catering for the party. Dad felt the food had been a bit strange with “those awkward little fish things, what do you call them”, and he had accidentally eaten a whole knob of wasabi, nearly choked and was not impressed. But anyway, I love little nibbley things and dips and mezze platters and will happily swap a meal to a bowl of something dippy and something crispy to dip in it. But mostly I do these types of things as a little starter before a dinner party. 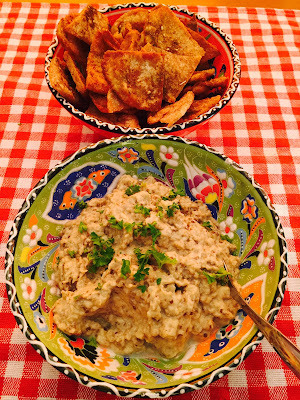 Baba Ghanoush is clearly a staple and to dip in it the best thing is crispy pitta triangles. Heat oven to 200C, prick the eggplant with a fork a few times and roast until soft, about 30-40 minutes. Let it cool a little and scrape the insides to a blender, add the rest of the ingredients and blitz. You can leave it a bit coarse, I like it that way. Or if you want it smoother, I’m not going to stop you. It’s nice either way. Check the taste and add salt or lemon if necessary. Put in a bowl and decoreate with a drizzle of olive oil and chopped fresh parsley. Heat olive oil, about half a cm / quarter an inch deep, in a pan. Fry pitta triangles in the oil on both sides until brown. Lift them on a plate covered with kitchen towel to drain. Sprinkle immediately with Za’atar, be generous with it. You could use any other dried herb or herb and spice mix as well.